Strange situations, unsolvable problems, secret lives, redemption and revenge. Who are the people behind the names? 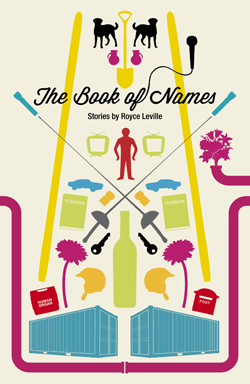 Frankie, Pavel, Willard, Esmeralda, Milo, Shannon … these are just some of the stories in The Book of Names. There’s a benevolent locksmith with keys to every lock in town. There’s a serial-killing vet who harvests his victims’ organs. A paediatrician battling her own imaginary friends. A group of men locked inside a container, stranded at a harbour somewhere. A performance artist who can open a bottle of champagne in an extraordinary way. And more. Royce Leville’s second book is a mesmerizing collection of the bizarre, the off-kilter, the strangely normal and the cleverly humorous. Royce Leville’s debut novel, A Little Leg Work, won the fiction category of the 2012 Next Generation Indie Book Awards. The Book of Names is his second book, and it won the Australia/NZ section of the 2015 IPPY awards.